preparing for juliet’s arrival was one of the funnest experiences in my life. 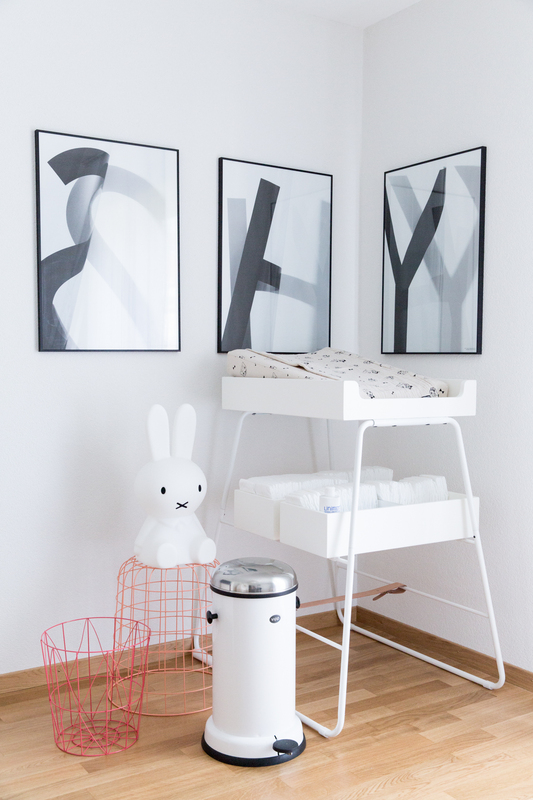 i spent so much time researching the perfect little details for her room and wardrobe, discovering the coolest brands and companies that have a stylish view on childhood. she was born a week early, and i was afraid our home wasn’t entirely ready for her, but when we brought her home i was surprised to realize she was what was missing before. when i put her on the changing table or in her cradle, something seemed to click. the last few doubts disappeared, and suddenly it seemed so obvious where everything should be. i’m still so in love with her little room, i thought it’d be nice to give you another peek. 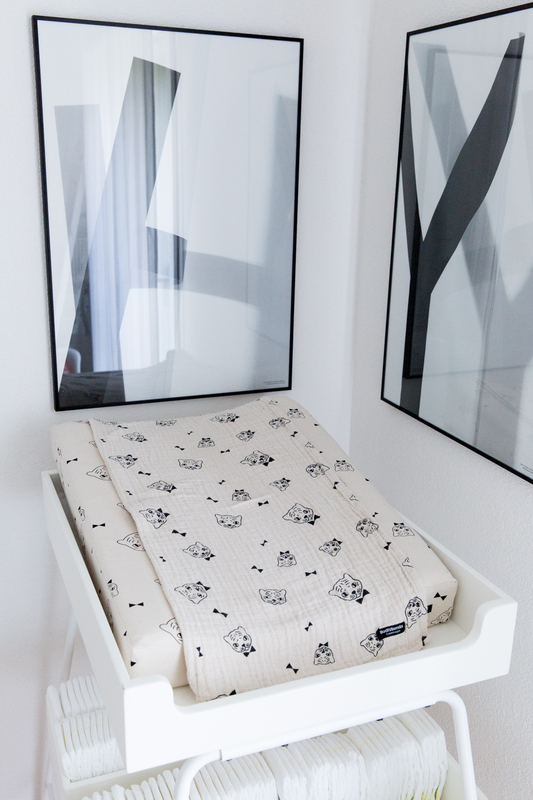 #thatcradle // we went back and forth on getting juliet a cradle – babies sleep in them for six months at most, and the one we had our eye on wasn’t exactly cheap – but i’m so happy we finally decided to go for it. the LEANDER cradle has been her little cocoon for the past few weeks. it’s made with the gorgeous OOH NOO bedding – a mix of the triangle and geometric print. aside from the lovely monochrome styles, the quality of these linens is just superb. they also make the rocking horse in the fifth picture, which to me is a beautiful design object, and which will hopefully be a big hit with juliet, too – in a year or so. #alsointhepics // you’ll see the hay ‘about a chair’ which we got at MASTER MEUBEL – before it’ll join our NEW LIVING ROOM, it’s the perfect place to feed juliet in the wee hours of the night, or rock her when she can’t sleep. // you’ll recognize the IKEA file cabinet from the SPRUTT COLLECTION which i introduced on the blog a while ago. 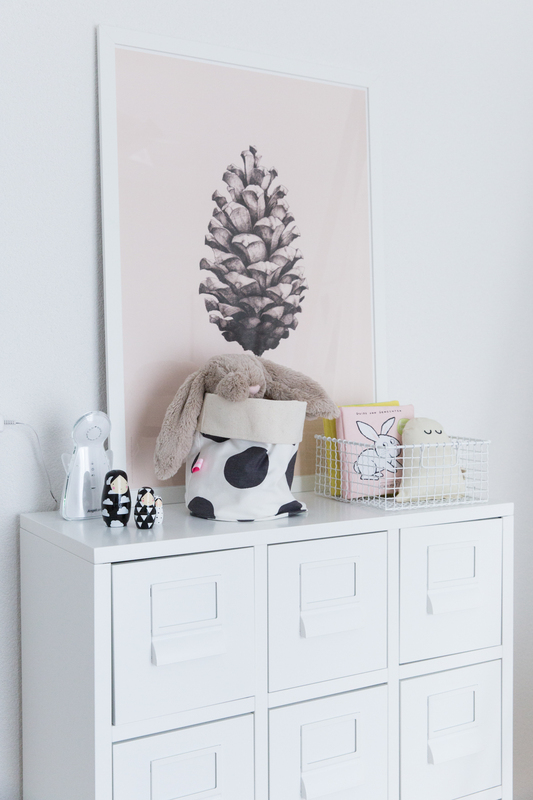 it’s where i rotate my favorite posters in frames – right now that’s the pretty pinecone from PAPER COLLECTIVE. // the dotted basket is from cérise sur le gateau, and the little ghost rattle is from fabelab – i got both via STUDIO AIMEE. // the bunny is from JELLYCAT, and the white wire basket from SERAX. // juliet’s big bed is the sparrow model from OEUF and made with bedding from jack n’a qu’un oeuil, all of which i got at KIDS LOVE DESIGN. 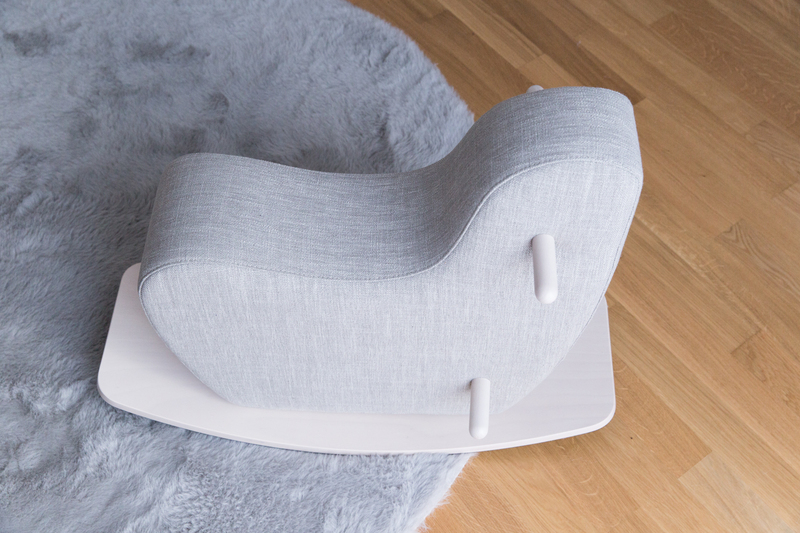 // the carpet is from pilepoil, also via KIDS LOVE DESIGN. // finally, in juliet’s closet behind the serax wire basket you’ll see a pretty paper bag from STUDIO BRENSTIJL, and next to it her impressive and growing collection of MINI MOCKS of which i’m not ashamed to say i’m incredibly jealous. wauw, echt wauw! mag je heel fier op zijn. Ah wat mooi! Ik ben nu zelf ook zwanger en aan het rond neuzen hoe het kamertje er uit komt te zien. 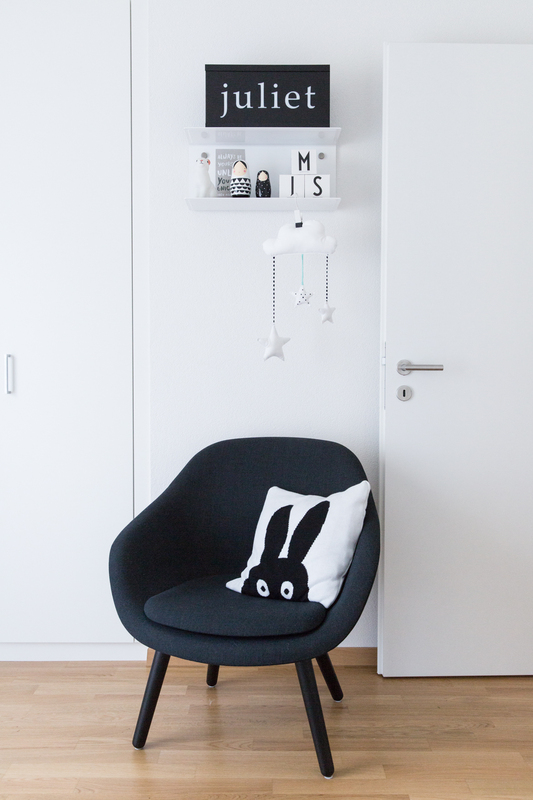 Ik denk grijzig met zwart wit en dan de kleur door wat accessoires en de kleertjes, boeken en mooie prints aan de muur. Mooi kamertje! 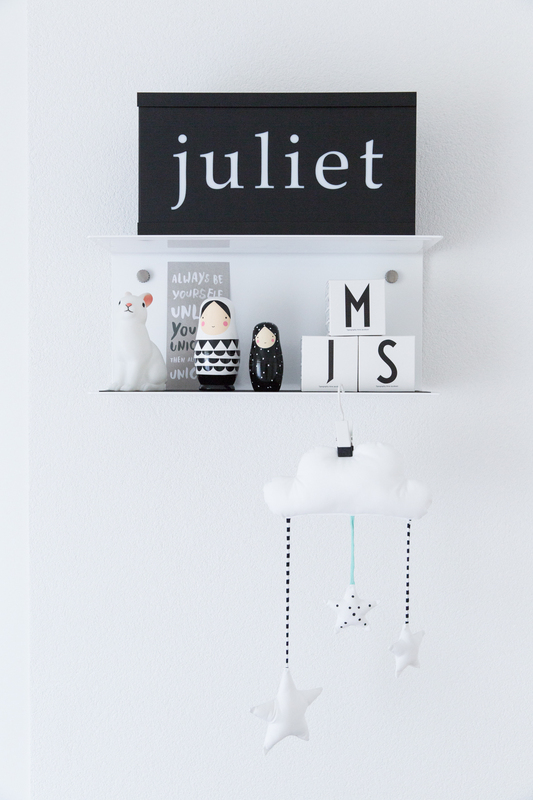 Wat een schitterende baby kamer ! Ik wil ook zo’n schommelpaard ;-). Zo mooi, Stephanie! Moet echt wel leuk geweest zijn om dit samen te stellen in aanloop naar de komst van kleine Juliet. Wondermooi gedaan!